I’m not EXACTLY comparing myself to the ancient Jews. But I did have an experience on Monday that made me appreciate their need to eat matzo (unleavened bread) because they were in a hurry to get out of Israel. They went with what they had, baking their bread before it was able to rise. I, too, ended up going with what I had—and part of what I had was matzo. I’m not EXACTLY comparing myself to the ancient Jews. 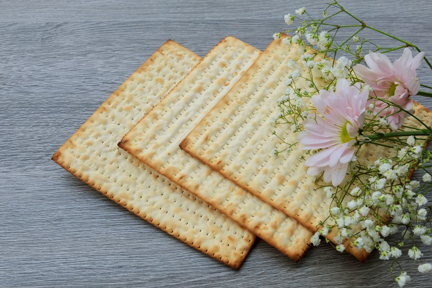 But I did have an experience on Monday that made me appreciate their need to eat matzo (unleavened bread) because they were in a hurry to get out of Egypt. They went with what they had, baking their bread before it was able to rise. I, too, ended up going with what I had—and part of what I had was matzo. Unfortunately, JD emailed me Monday evening to let me know that he was feeling horribly ill. I was stuck with an extra segment to fill at the last minute. My general store had already closed for the night, and I am not the sort of person who gets up early in the morning to shop. I thus had to plan a dish that would use ingredients I had in the house. I decided to continue the matzo theme (it was still Passover, after all) and make matzo brei. For those of you not in the know, this egg dish is a cross between scrambled eggs and French toast. The result was ideal comfort food, and a wonderful way to use up some of the matzo I had in the house. I recommend it highly. 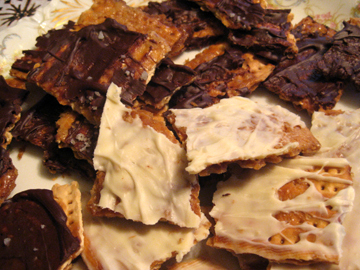 If you feel obliged to finish up your meal with a little matzo crunch, feel free to make that as well. Melt the butter in a 10-inch nonstick skillet. Sauté the onion pieces over medium-low heat until they turn golden brown, about 10 minutes. While the onion is sautéing, place the matzo pieces in a colander, and place the colander in the sink. Pour boiling water over the matzo until all the pieces are damp. Drain the matzo pieces in the colander. Set aside about 1/4 cup of the cheese. Stir together the eggs and the remaining cheese in a large bowl. Add the drained matzo pieces and combine well. Add this mixture to the onions, adding a little more butter/fat if needed to keep the eggs from sticking. Cook over medium-low heat, stirring as needed, until the eggs set. Spoon the egg mixture onto a serving plate. Pour the salsa on top, and garnish with the remaining cheese and the chives. Serve with extra salsa. Serves 2 to 4, depending on appetite. This week I returned to cook once more with my friends at Mass Appeal. 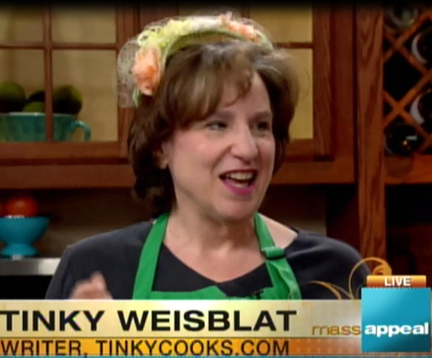 I do a lot of fun things in the winter, but I don’t cook on TV. My Hawley hill is a bit hard to negotiate in icy weather. Ice is now a thing of the past, however (and wasn’t too much with us this past winter anyway!). The daffodils waft in the breeze, my dog Cocoa has a new spring in her step, and I’m back with co-hosts Seth Stutman and Ashley Kohl. The gang at Mass Appeal wanted to look ahead to Cinco de Mayo—and so did I. 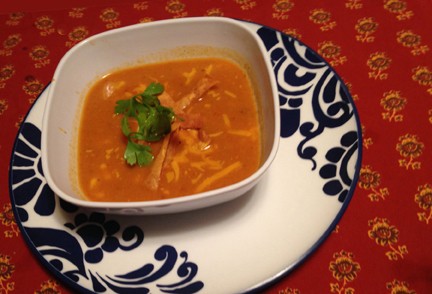 So I revised my previous recipe for tortilla soup. I love the way this soup came out! It’s warm enough for the cool temperatures we’re having yet spicy enough to evoke Mexico and the American southwest. If you forget about the cheese and the tortilla crisps, it’s reasonably healthy as well. 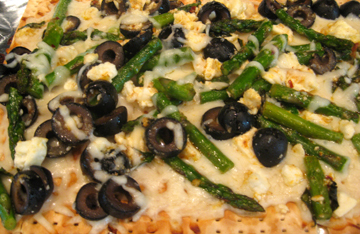 Here is my new recipe—and below I am sharing the videos for both dishes I made. Happy Passover. Happy Cinco de Mayo. Happy SPRING! And happy birthday to my dear friend Peter. In a 4-quart pot or Dutch oven heat a little olive oil. Add the onions, the garlic, and the green pepper. Cook, stirring occasionally, until the vegetables are tender (5 minutes or so). Cut the tortillas into strips. Add the strips from 3 tortillas to the vegetable mixture (set the others aside), along with the chili powder and the cumin. Cook, stirring occasionally, for another minute. Add the chicken stock, salt, tomatoes, and chipotle, and bring the mixture to a boil. 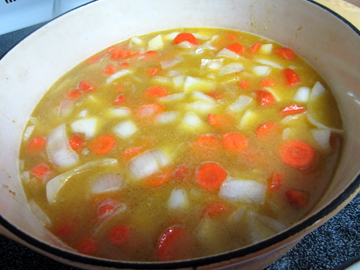 Turn down the heat and simmer the soup, almost covered, for 25 minutes. While the soup is simmering use the remaining tortilla strips to make a garnish of fried yumminess. Let them sit on paper towels for at least 15 minutes to dry out; then fry them in oil until they are crispy. Set them aside to drain on the paper towels. Remove the soup from the heat, and puree it with an immersion blender. (You may also use a regular blender as long as you blend carefully in batches.) Stir in the chicken and the corn, if you are using them, and return the soup to the boil. Ladle into bowls. Garnish the soup with your homemade tortilla strips plus any other garnish of your choice. Serves 4. And here are the videos! Food makes memory concrete in a way nothing else can–except perhaps music. 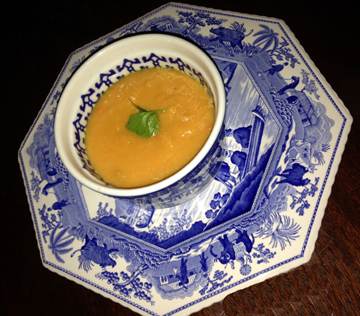 When we make or taste a dish we forge a physical, sensory link to the person who inspired or gave us the recipe. We can almost reach out and touch the dead, nourished by their love. Laura at the blog The Spiced Life understands this connection. She is hosting a blogging event in which she asks food bloggers to write about their grandmothers’ culinary accomplishments. I went to my paternal grandmother’s house every spring for Passover so I tend to think of her a lot at this time of year. My father’s mother wasn’t what I’d call kitchen oriented. As a young woman she lived a busy life outside the home instead of cooking. We were told she had been a spy in her youth (or at least a smuggler—the tales were all a little murky). 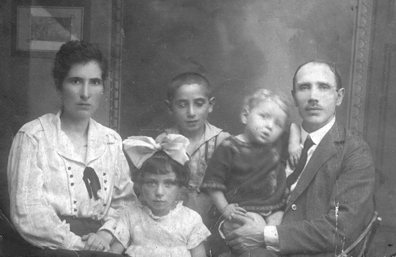 Sarah Hiller Weisblat came to this country from Poland in 1920 with her husband and three small children. Her brothers had already immigrated and set up a business in New York City; they gave my grandfather a job so that he could support the family. My grandmother had many skills. She and her mother, who also immigrated (although she refused to learn English), ran their family and eventually their new neighborhood. My grandmother radiated competence. I recently learned from my father’s cousin Herb that she delivered him. I don’t know whether a midwife or doctor was unavailable or whether this was something my Nana did on a semi-regular basis! She was also diplomatic (perhaps a hangover from her days as a spy). 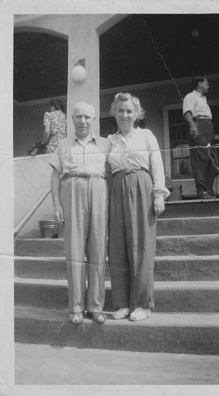 When my Jewish father fell in love with my Christian mother, neither set of parents was thrilled. It wasn’t a time when a lot of intermarriage took place. Nevertheless, my grandmother welcomed my mother to the family and defended her against any criticism. She recognized a fellow smart, able woman when she saw one. As I noted above, my grandmother didn’t do a lot in the kitchen, at least not by the time I met her. Perhaps her mother was the family cook. My father used to recall seeing a carp swimming in the bathtub in his childhood just before it was time to make gefilte fish. In my youth the gefilte fish came out of a jar. I do remember two things that my grandmother made well and on a regular basis—pot roast and matzo-ball soup. 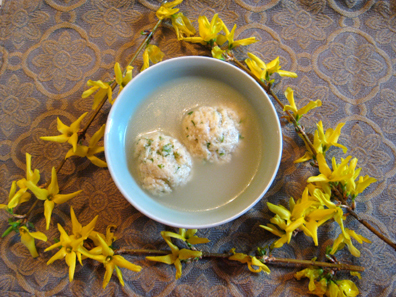 The matzo ball soup was particularly visible at Passover since the most prominent food on the Passover table is matzo, unleavened bread. When the Jews were finally allowed to leave Egypt in the Exodus story, they were in such a hurry that they baked their bread without letting it rise. 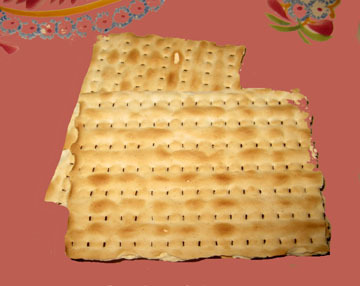 In commemoration of this event their descendants eat no bread except matzo during Passover, which lasts for eight days. 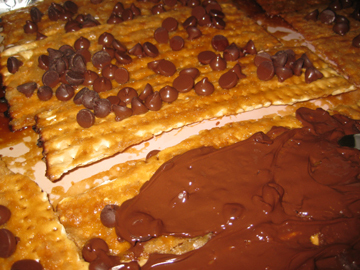 Matzo meal (ground matzo) is a staple of Passover cooking. For the non-cognoscenti, matzo-ball soup is a bit like chicken-noodle soup. The balls resemble dumplings in chicken broth. The best matzo-ball soup—the kind everyone’s grandmother (including mine) used to make—is created with homemade chicken or turkey stock. You may use a high-quality broth from the store, however. The trick to this soup is not to make the matzo balls too big; if you do, they swell up and overwhelm your soup! You may of course jazz up the soup by adding chopped vegetables and/or a little ginger to the matzo balls. As a sodium freak I actually like to add a drop of soy sauce to my stock. My grandmother made basic matzo-ball soup, however, so basic matzo-ball soup this is. 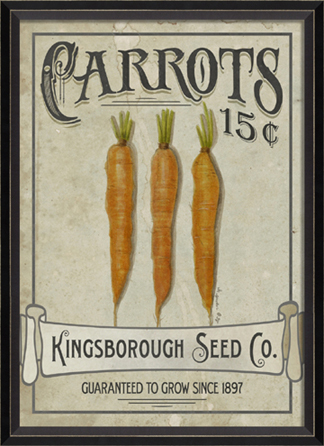 When I make or taste it I am transported back to the home at which we visited my grandparents in Long Beach, New York. This tiny house always seemed to expand to accommodate the many relatives and friends who came to visit, particularly at Passover. My grandmother’s Seder table there was a symbol of her hospitality, of her generous personality, and of the ties that brought family and friends together at holidays. It was never without matzo-ball soup. In a small bowl, beat the eggs.With a balloon whisk, whisk in the parsley, dill, onion (if using), soda water, oil, salt, and pepper.Then stir in the matzo meal.Cover the mixture, and refrigerate it for at least an hour but not more than 6 hours. Oil your hands, and shape the dough into small balls (about 1/2 inch across). Pop the balls CAREFULLY into salted boiling water. Boil the balls, covered, for 25 minutes over medium-low heat.Do not peek at the balls while they are cooking. Drain the matzo balls. Bring the chicken stock to a boil, covered, and put the balls in it. Boil, covered, for at least 15 minutes. Serves 4 to 5.